Since 1611, humans have recorded the comings and goings of black spots on the sun. The number of these sunspots waxes and wanes over approximately an 11-year cycle -- more sunspots generally mean more activity and eruptions on the sun and vice versa. 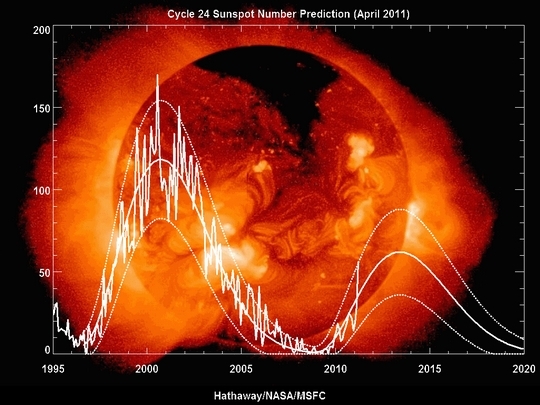 The number of sunspots can change from cycle to cycle, and 2008 saw the longest and weakest solar minimum since scientists have been monitoring the sun with space-based instruments. Observations have shown, however, that magnetic effects on Earth due to the sun, effects that cause the aurora to appear, did not go down in synch with the cycle of low magnetism on the sun. Now, a paper in Annales Geophysicae that appeared on May 16, 2011 reports that these effects on Earth did in fact reach a minimum -- indeed they attained their lowest levels of the century -- but some eight months later. The scientists believe that factors in the speed of the solar wind, and the strength and direction of the magnetic fields embedded within it, helped produce this anomalous low. "Historically, the solar minimum is defined by sunspot number," says space weather scientist Bruce Tsurutani at NASA's Jet Propulsion Laboratory in Pasadena, Calif., who is first author on the paper. "Based on that, 2008 was identified as the period of solar minimum. But the geomagnetic effects on Earth reached their minimum quite some time later, in 2009. So we decided to look at what caused the geomagnetic minimum." The NWS added in its statement that a similar explosion of the same magnitude occurred five years ago, with the present one measured by NASA as M-2 or medium sized solar flare that carries "a substantial coronal mass ejection (CME) ... and is visually spectacular." NASA said in a statement that the observed solar flare reached its peak at 0341 AEST on Tuesday, in which "the large cloud of particles mushroomed up and fell back down looking as if it covered an area of almost half the solar surface." That spontaneous solar activity, however, is expected to cause minimal effect on Earth since the impact of the explosion will not directly travel towards the planet's direction. At most, the NWS said that the eruption will likely bring minor (G1) to moderate (G2) levels of geomagnetic storm activities, which could disturb Earth's power grids and global positioning systems that heavily rely on satellite communications. Sunspot cycles over the last century. The blue curve shows the cyclic variation in the number of sunspots. Red bars show the cumulative number of sunspot-less days. The minimum of sunspot cycle 23 was the longest in the space age with the largest number of spotless days. Credit: Dibyendu Nandi et al. Scientists reckon they've cracked the mystery as to why during 2008-2009, the Sun was completely devoid of sunspots for almost two years. This deepest solar minimum in a century, marking the end of sunspot cycle 23, saw the Sun's global magnetic field and solar wind weaken, allowing dangerous cosmic rays to sweep the inner solar system. It also prompted a cooling and collapse of Earth's upper atmosphere in the absence of the UV ray heating normally provided by sunspot activity. 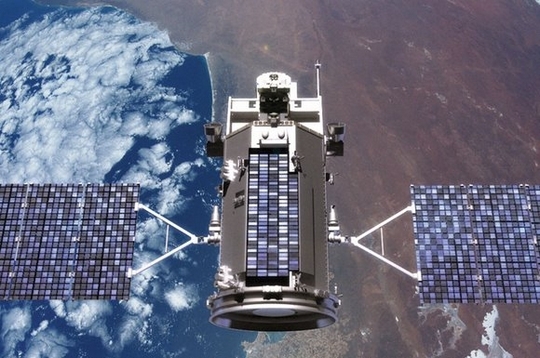 "Space junk stopped decaying as rapidly as usual and started accumulating in Earth orbit," NASA explains. WASHINGTON, Feb. 28, 2011 /PRNewswire-USNewswire/ -- NASA will host a media teleconference at 1 p.m. EST on Thursday, March 3, to discuss the first computer model that explains the recent period of decreased solar activity during the sun's 11-year cycle. 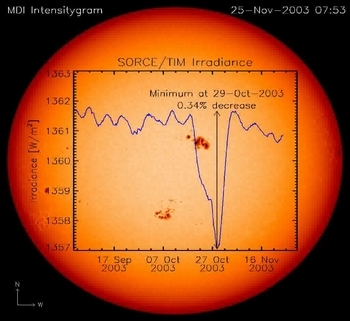 The recent solar minimum, a period characterized by a lower frequency of sunspots and solar storms, ended in 2008 and was the deepest observed in almost 100 years. NASA is launching an Earth-orbiting satellite called Glory tomorrow that will tackle a highly charged question: How much can the sun contribute to climate change? (PhysOrg.com) -- For more than two centuries, scientists have wondered how much heat and light the sun expels, and whether this energy varies enough to change Earth’s climate. In the absence of a good method for measuring the sun's output, the scientific conversation was often heavy with speculation. By 1976, that began to change when Jack Eddy, a solar astronomer from Boulder, Colo., examined historical records of sunspots and published a seminal paper that showed some century-long variations in solar activity are connected with major climatic shifts. Eddy helped show that an extended lull in solar activity during the 17th Century --called the Maunder Minimum -- was likely connected to a decades-long cold period on Earth called the "Little Ice Age." Two years after Eddy published his paper, NASA launched the first in a series of satellite instruments called radiometers, which measure the amount of sunlight striking the top of Earth's atmosphere, or total solar irradiance. Radiometers have provided unparalleled details about how the sun's irradiance has varied in the decades since. Such measurements have helped validate and expand upon Eddy's findings. And they've led to a number of other discoveries—and questions—about the sun. Without radiometers, scientists would probably still wonder how much energy the sun emits and whether it varies with the sunspot cycle. They wouldn't know of the competition between dark sunspots and bright spots called faculae that drives irradiance variations. And they’d have little chance of answering a question that continues to perplex solar experts today: Has overall irradiance changed progressively throughout the past three 11-year cycles, or are variations in the sun's irradiance limited to a single cycle? WASHINGTON, March 18 /PRNewswire-USNewswire/ -- NASA EDGE, an award-winning talk show known for offbeat, funny and informative behind-the-scene stories about the space agency, will celebrate Sun-Earth Day 2010, with a live webcast about our sun and its effects on Earth. The program will air at 1 p.m. EDT, Saturday, March 20, from the exhibit floor of the National Science Teachers Association conference in Philadelphia. This year's focus is magnetic storms created by the sun. Magnetism, a force that affects our everyday lives, plays a key role in the workings of the sun. Its force also is responsible for coronal mass ejections, the most violent explosions in the solar system. NASA research about these storms will help scientists increase their understanding of the connections between the sun and its planets. Scientists also will be able to better predict the impact of solar activity on humans and technological systems. The NASA EDGE program will feature interviews with scientists, educators and students. Viewers will hear discussions and see demonstrations about the power of magnetism and how magnetic storms affect them. Science centers and museums around the world will provide images from NASA satellites studying the sun and other multimedia products for educators, students and the public.